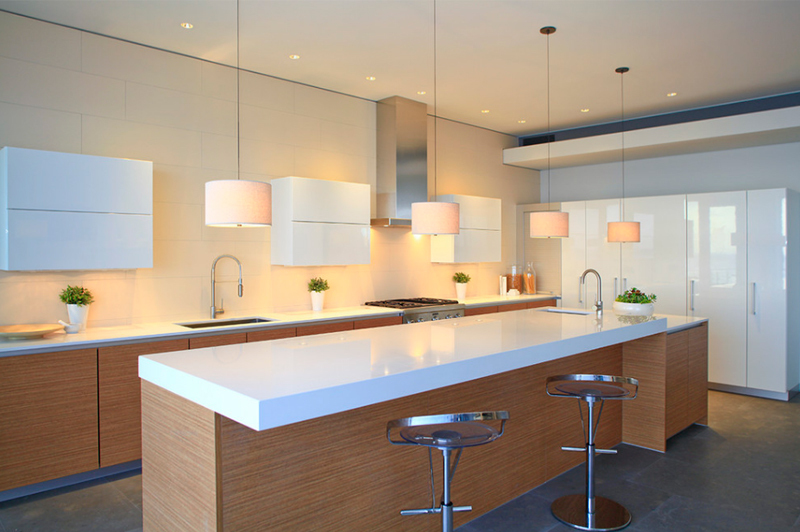 White looks neat for a kitchen especially for a countertop! When you think about it, it’s usually the countertops that brings out the beauty of a kitchen; I don’t think that you’d disagree with me, because it is in fact makes of breaks our first impression of the kitchen. When we see a beautiful and clean countertop, we know that this kitchen is indeed well taken care of and if it comes with well-arranged decors – this kitchen is heaven! 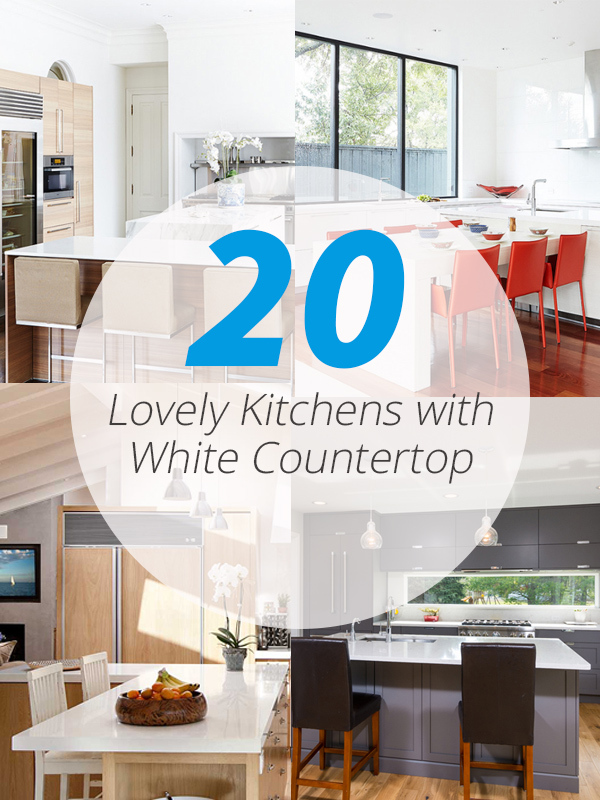 Below is a list of 20 Lovely Kitchens with White Countertops that are not only clean and sleek, but still sophisticated and filled with awesome feels of how kitchens should actually look like. Black granite or tiled countertops look incredible too, but when you see a white one, you’d think that this is what we should be having at home because we’d be able to see if one is in fact clean or not – if the homeowners take care of it or not. Check out the kitchen designs below and tell me what you think about them. 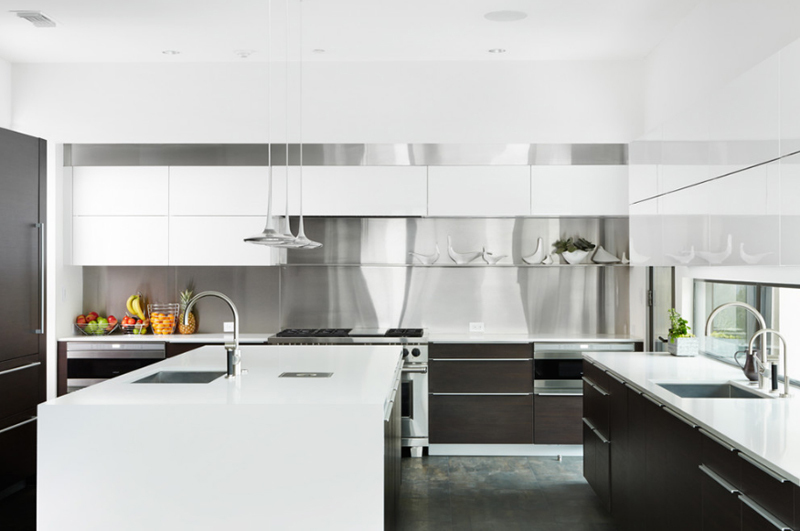 I love clean spaces as much as anyone, and especially for people who hates dirt and loves seeing their kitchens clean and bright, I think choosing a white countertop could really go a long way. Check out the counters here and the cabinets too – who says only clothes should be matchy? The L-shaped counter in this photo is something really nice to look at – even with the kitchen island being in grey marble or granite – this kitchen is blessed with the most beautiful things in terms of home design and it looks really incredible! 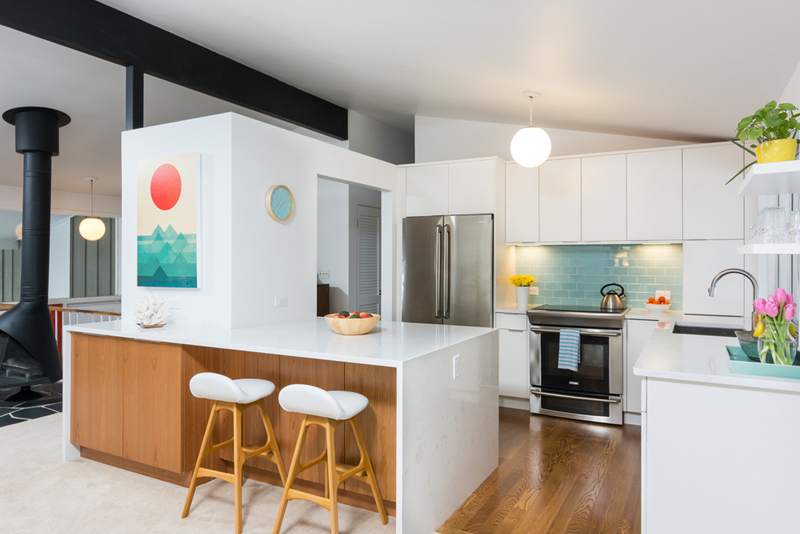 The photos that I’ve picked for this list has both the counters in white – for the countertop itself and that of the bar or the kitchen island – depending on what’s available on the house itself. In here, we see that this kitchen has an L-shaped countertop and a long kitchen bar – both totally awesome, both totally neat! See the contrast present in this kitchen photo? It looks quite interesting and I think it looks quite special. I love wood and kitchen is probably the place in the house that has most of it and it looks great especially when done in the right amount and in the right color! 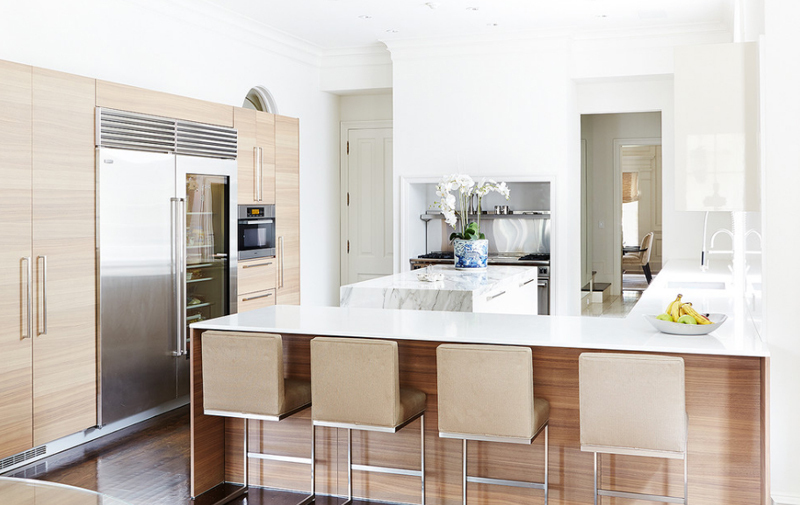 The center of this kitchen is probably the island/bar; multi-purpose furniture like this one sure is nice and saves people – both the home owner and the designer with time, money and space. 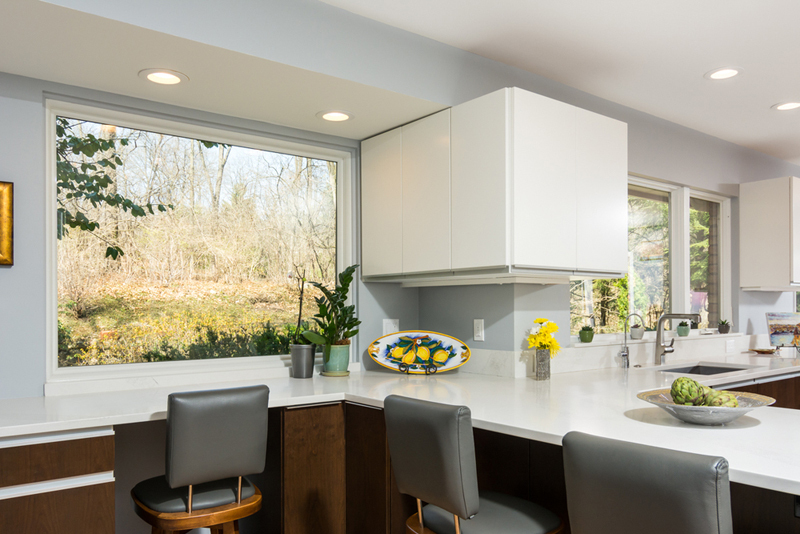 Who doesn’t want a larger space in the kitchen right? Or in any part of the house, that is. 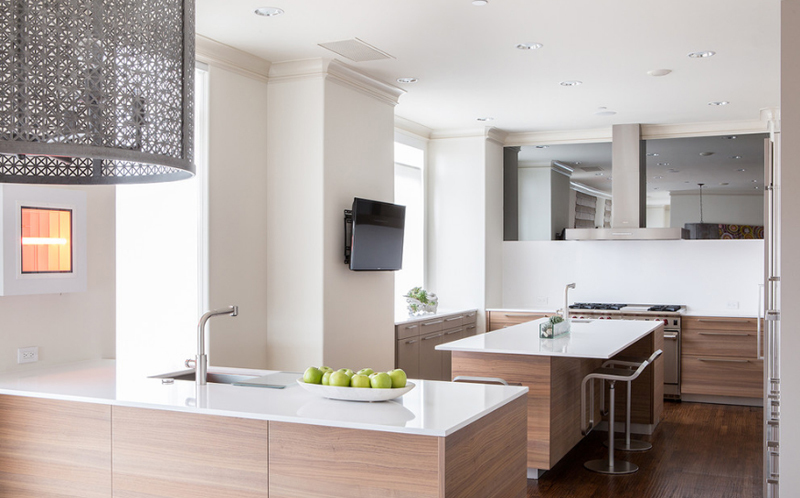 Check out what they did with the kitchen island with the exposed wood on the side? I think that it’s definitely cool and helps with the entire design. Contrast on the color and material helped a lot. The color of the wood veneer in this kitchen is quite nice. I think this is how light I would want wood or wood veneers in my own house. This kitchen is not that large, but I think that it sure looks quite wonderful and comfortable enough for food preparation and cooking. The white space that we see in this photo is really pretty! Do you agree? From the cabinets, to the drawers, to the kitchen bar and that small room (which could be the pantry) looks perfect! Adding hints of colors in here like the plants, the back splash and the paintings helped in making this space looks incredible! I really made sure that this kitchen would be added on this list because it looks really pretty and interesting. It has a lot of things going on and it is something people would want to go home to. The color contrast on the wood works and the tile work used and done here is something pretty and exciting! Studying about LEED standards, it is known that this home is a certified green home! Aside from aesthetics, materials and how this house was made sure has a lot going on which made it really special and worthy of the Gold certification. 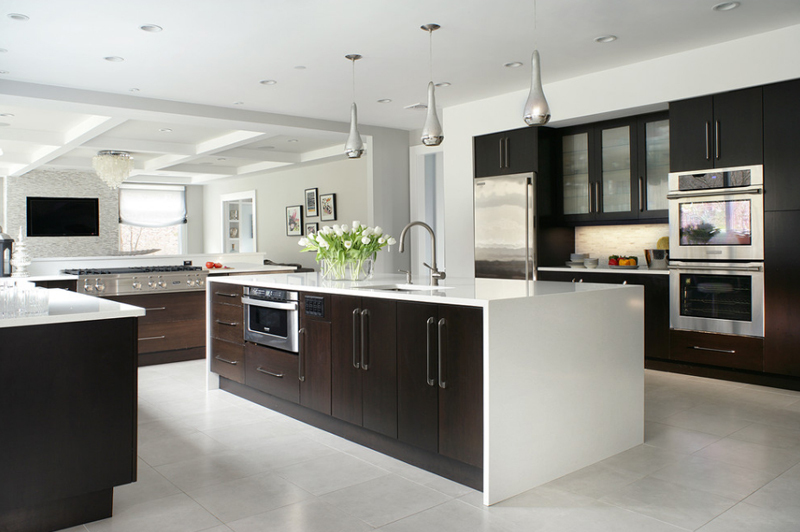 This black and white kitchen looks incredible and fancy! The way that this kitchen is done has made it look real fancy and sophisticated. 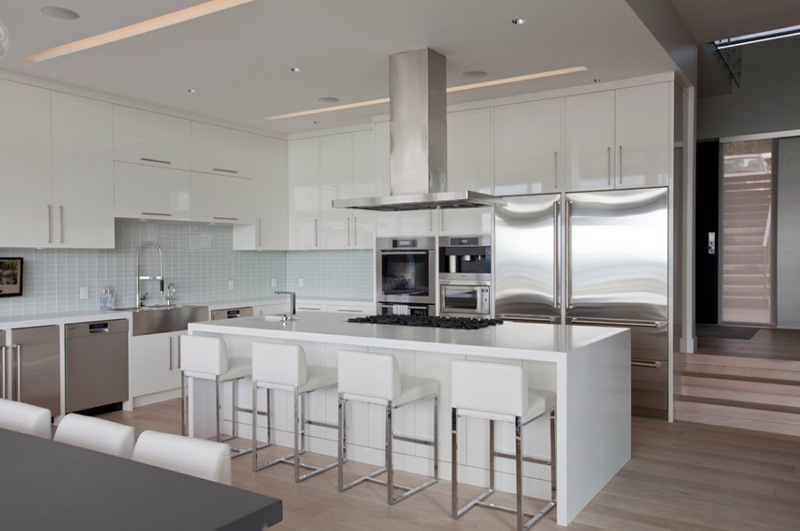 Classy kitchens like this one makes me wonder how could you cook and still maintain a stunning kitchen like this one? I love the design and color of the back splash used here. The back splash looks awesome against all the white that’s going on in this kitchen! The large industrial pendant light sure is nice and cool, I love it! If you ask me, most of the photos that I have found under this category were mostly black and white but I tried a little bit better in locating more kitchen spaces that more browns in them or other colors if ever. 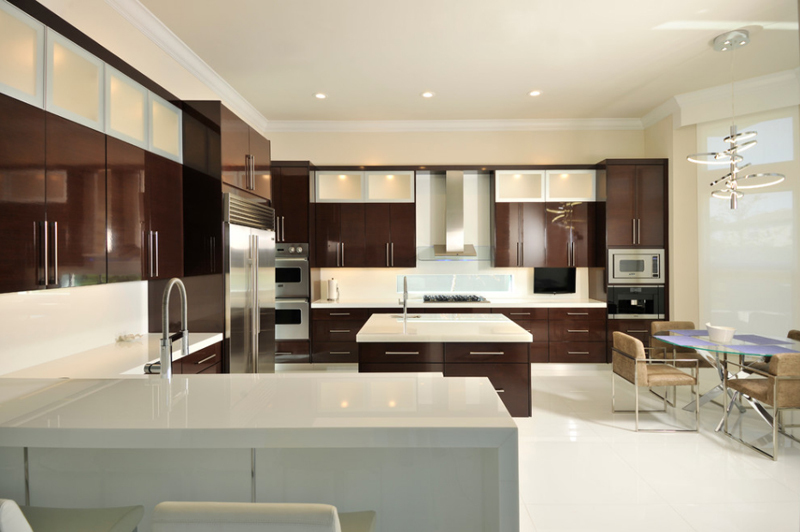 Example is this kitchen, it is in black and white but it has hints of brown in some of its cabinets. 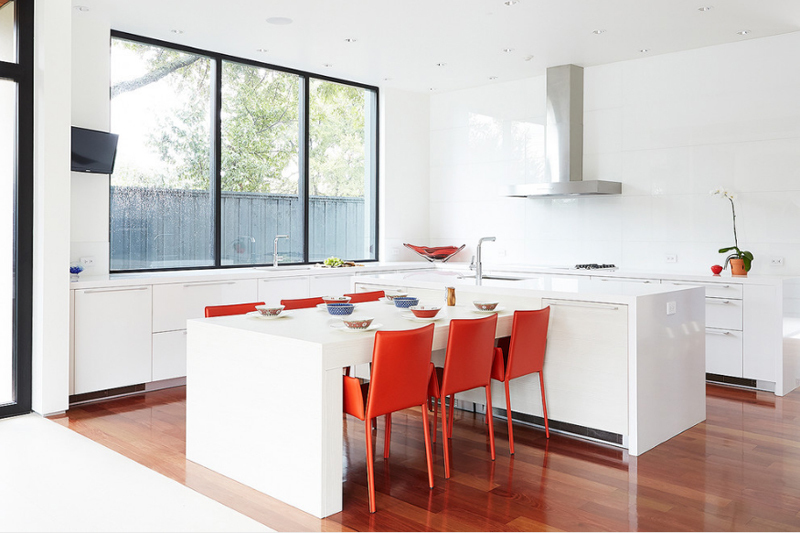 With large glass windows in the kitchen like this one, I think cooking would be more inspiring because you get to see how stunning the view outside is. Checking on the weather could mean you knowing if you would go out or not to go picking on the basil plants you have outside! 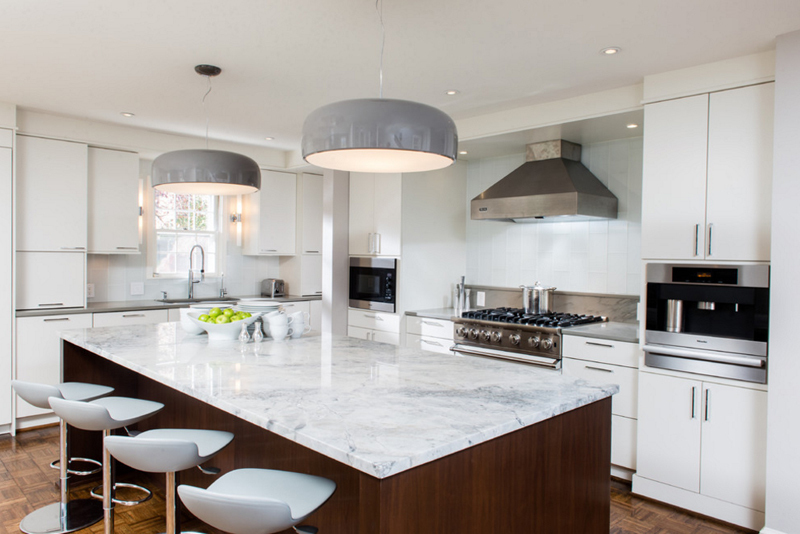 These large drum pendants look like expensive bowls you put your food in when you’re eating – it means that it looks really pretty and ideal for the kitchen! I totally love it! How about you? 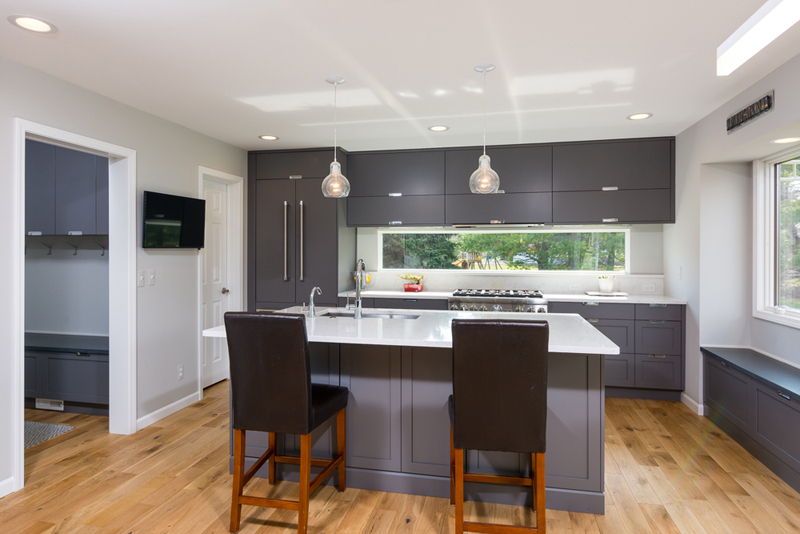 This light grey color against all the whites that we get to see in this kitchen space allows us to relax our eyes and absorb all the beauty that this kitchen is actually throwing at us! If want a calm looking kitchen, I think you can for colors like this and even light greens or blues! 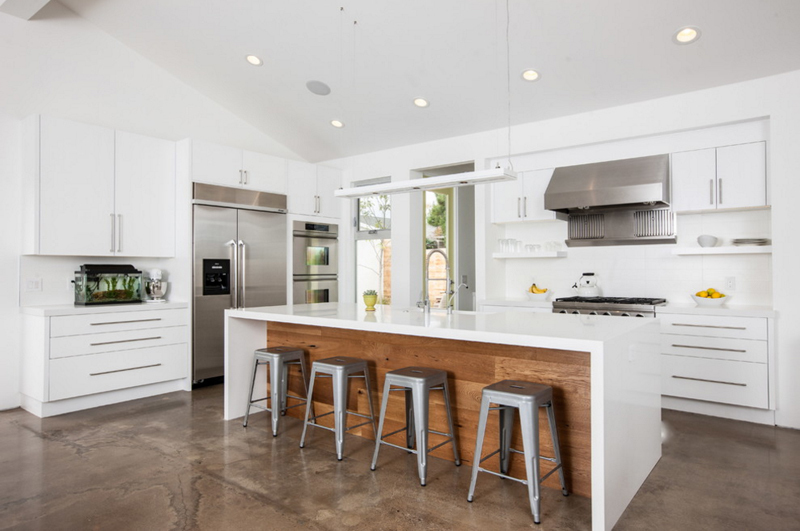 Good thing that this beautiful white kitchen has brown flooring and kitchen stools that have brown seats on them because if this space was actually all! Oh, I totally love the red chairs that were added to the kitchen nook! It gives this kitchen a bit color and a lot of love! That’s for sure! I think that it’s nice that they have large windows for them to have a view of the outdoors like for times when their kids are outside playing. 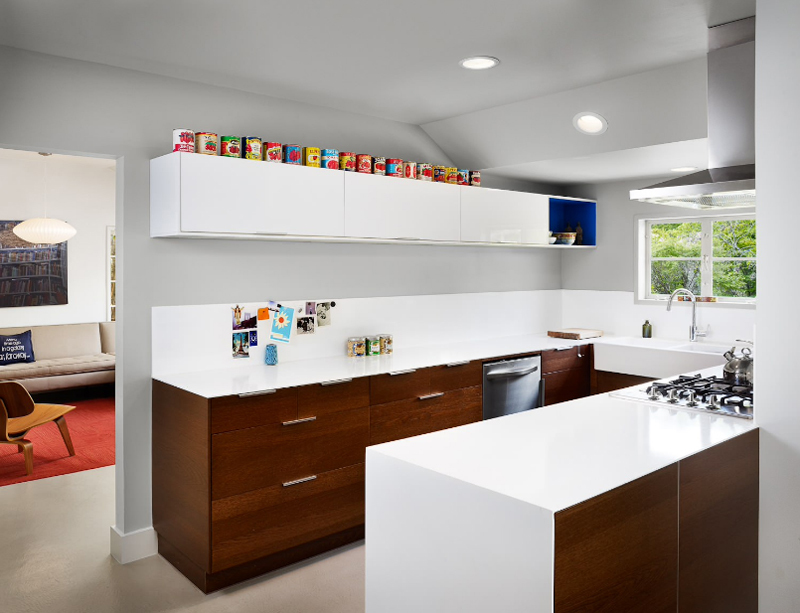 Well, I’m sure glad that this kitchen has great colors in it – very minimal but quite a feat! The color is easy to the eyes and it adds more fun to this space that has enough texture and love to it. A nice Tiburon home from Ann Lowengart. 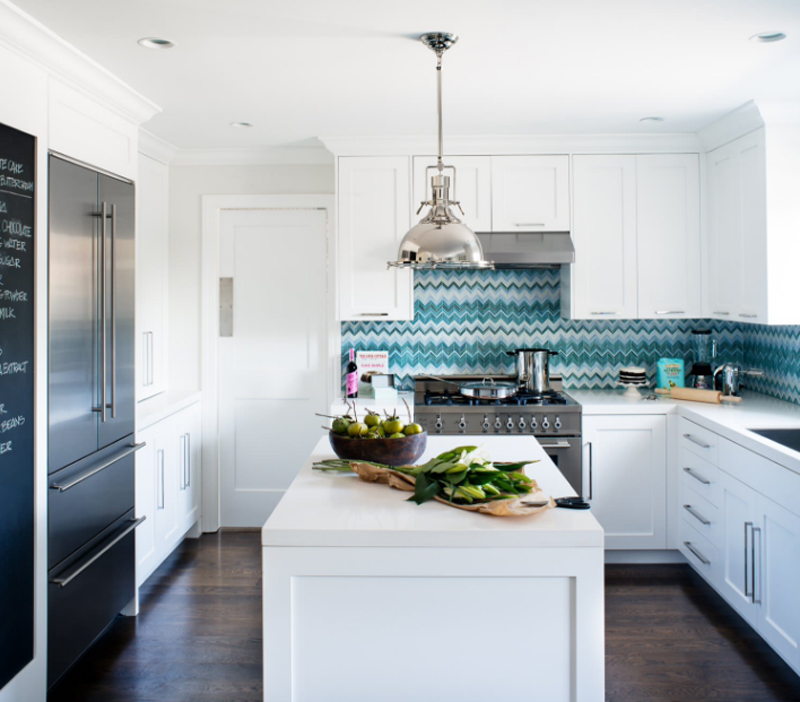 If you loved this list, I think that you’d actually love the list I created before too – the ones about the 24 Stylish Black and White U-Shaped Kitchen. Obviously, black and white is one color combination that would not really get old nor lose its class and style. Share both these lists with your friends for them to check out the spaces and admire them! More beautiful lists like this one, only here in Home Design Lover!